In telecommunications, RS-232 is a standard for serial communication transmission of data. It formally defines the signals connecting between a DTE (data terminal equipment) such as a computer terminal, and a DCE (data circuit-terminating equipment or data communication equipment), such as a modem. The RS-232 standard is commonly used in computer serial ports. The standard defines the electrical characteristics and timing of signals, the meaning of signals, and the physical size and pinout of connectors. The current version of the standard is TIA-232-F Interface Between Data Terminal Equipment and Data Circuit-Terminating Equipment Employing Serial Binary Data Interchange, issued in 1997. An RS-232 serial port was once a standard feature of a personal computer, used for connections to modems, printers, mice, data storage, uninterruptible power supplies, and other peripheral devices. However, RS-232 is hampered by low transmission speed, large voltage swing, and large standard connectors. In modern personal computers, USB has displaced RS-232 from most of its peripheral interface roles. 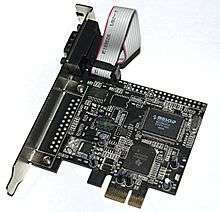 Many computers do not come equipped with RS-232 ports and must use either an external USB-to-RS-232 converter or an internal expansion card with one or more serial ports to connect to RS-232 peripherals. Nevertheless, RS-232 devices are still used, especially in industrial machines, networking equipment, and scientific instruments. The standard does not define such elements as the character encoding, the framing of characters, or error detection protocols. The character format and transmission bit rate are set by the serial port hardware which may also contain circuits to convert the internal logic levels to RS-232 compatible signal levels. The standard does not define bit rates for transmission, except that it says it is intended for bit rates lower than 20,000 bits per second. The standard has been renamed several times during its history as the sponsoring organization changed its name, and has been variously known as EIA RS-232, EIA 232, and, most recently as TIA 232. The standard continued to be revised and updated by the Electronic Industries Alliance and since 1988 by the Telecommunications Industry Association (TIA). Revision C was issued in a document dated August 1969. Revision D was issued in 1986. The current revision is TIA-232-F Interface Between Data Terminal Equipment and Data Circuit-Terminating Equipment Employing Serial Binary Data Interchange, issued in 1997. Changes since Revision C have been in timing and details intended to improve harmonization with the CCITT standard V.24, but equipment built to the current standard will interoperate with older versions. In revision D of EIA-232, the D-subminiature connector was formally included as part of the standard (it was only referenced in the appendix of RS-232 C). The voltage range was extended to ±25 volts, and the circuit capacitance limit was expressly stated as 2500 pF. Revision E of EIA 232 introduced a new, smaller, standard D-shell 26-pin "Alt A" connector, and made other changes to improve compatibility with CCITT standards V.24, V.28 and ISO 2110. For peripherals connecting to a PC, the PC is DTE, and the peripheral is DCE. If identical units need to interconnect then a cross-over or null-modem cable is needed. USB is designed to make it easy for device drivers to communicate with hardware. USB is more complex than the RS-232 standard because it includes a protocol for transferring data to devices. This requires more software to support the protocol used. There is no direct analog to the terminal emulator programs that let users communicate directly with serial ports. Serial ports of personal computers are also sometimes used to directly control various hardware devices, such as relays or lamps. Personal computers may use a serial port to interface to devices such as uninterruptible power supplies. In some cases, serial data is not exchanged, but the control lines are used to signal conditions such as loss of power or low battery alarms. An application program can detect or change the state of RS-232 control lines in the registers of the serial hardware using only a few input/output instructions; by contrast, a USB interface requires software to decode the serial data. In fields such as laboratory automation or surveying, RS-232 devices may continue to be used. PLCs, VFDs, servo drives, and CNC equipment are programmable via RS-232. Some manufacturers have responded to this demand: Toshiba re-introduced the DE-9M connector on the Tecra laptop. The RS-232 standard defines the voltage levels that correspond to logical one and logical zero levels for the data transmission and the control signal lines. Valid signals are either in the range of +3 to +15 volts or the range −3 to −15 volts with respect to the "Common Ground" (GND) pin; consequently, the range between −3 to +3 volts is not a valid RS-232 level. For data transmission lines (TxD, RxD, and their secondary channel equivalents), logic one is defined as a negative voltage, the signal condition is called "mark". Logic zero is positive and the signal condition is termed "space". Control signals have the opposite polarity: the asserted or active state is positive voltage and the deasserted or inactive state is negative voltage. Examples of control lines include request to send (RTS), clear to send (CTS), data terminal ready (DTR), and data set ready (DSR). Because both ends of the RS-232 circuit depend on the ground pin being zero volts, problems will occur when connecting machinery and computers where the voltage between the ground pin on one end, and the ground pin on the other is not zero. This may also cause a hazardous ground loop. Use of a common ground limits RS-232 to applications with relatively short cables. If the two devices are far enough apart or on separate power systems, the local ground connections at either end of the cable will have differing voltages; this difference will reduce the noise margin of the signals. Balanced, differential serial connections such as RS-422, RS-485, and USB can tolerate larger ground voltage differences because of the differential signaling. The standard recommends the D-subminiature 25-pin connector, but does not make it mandatory. Most devices only implement or use a few of the twenty signals specified in the standard, so connectors and cables with fewer pins are sufficient for most connections, more compact, and less expensive. Personal computer manufacturers replaced the DB-25M connector with the smaller DE-9M connector. This connector, with a different pinout (see Serial port § Pinouts), is prevalent for personal computers and associated devices. The standard does not define a maximum cable length, but instead defines the maximum capacitance that a compliant drive circuit must tolerate. A widely used rule of thumb indicates that cables more than 15 m (50 ft) long will have too much capacitance, unless special cables are used. By using low-capacitance cables, full speed communication can be maintained over larger distances up to about 300 m (1,000 ft). For longer distances, other signal standards are better suited to maintain high speed. Equipment using this protocol must be prepared to buffer some extra data, since a transmission may have begun just before the control line state change. ↑ EIA standard RS-232-C: Interface between Data Terminal Equipment and Data Communication Equipment Employing Serial Binary Data Interchange. Washington: Electronic Industries Association. Engineering Dept. 1969. OCLC 38637094. 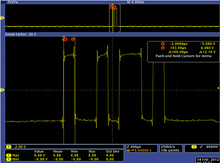 ↑ "RS232 Tutorial on Data Interface and cables". ARC Electronics. 2010. Retrieved 28 July 2011. ↑ "TIA Facts at a Glance". About TIA. Telecommunications Industry Association. Retrieved 28 July 2011. ↑ Horowitz, Paul; Winfield Hill (1989). The Art of Electronics (2nd ed.). Cambridge, England: Cambridge University Press. pp. 723–726. ISBN 0-521-37095-7. ↑ PC 97 Hardware Design Guide. Redmond, Wash: Microsoft Press. 1997. ISBN 1-57231-381-1. ↑ Wilson, Michael R. (January 2000). "TIA/EIA-422-B Overview" (PDF). Application Note 1031. National Semiconductor. Retrieved 28 July 2011. ↑ Lawrence, Tony (1992). "Serial Wiring". A. P. Lawrence. Retrieved 28 July 2011. ↑ Ögren, Joakim (18 September 2008). "Serial (PC 25)". Hardware Book. Retrieved 28 July 2011. ↑ Casey Leedom (1990-02-20). "Re: EIA-232 full duplex RTS/CTS flow control standard proposal". Newsgroup: comp.dcom.modems. Usenet: 49249@lll-winken.LLNL.GOV. Retrieved 2014-02-03.